The 145-mile transmission line would sluice electricity from Canada's Hydro Quebec dam system to the Lewiston area, where it would hook up with the regional grid, ultimately serving customers in Massachusetts. The 145-mile transmission line would sluice electricity from Canada's Hydro Quebec dam system to the Lewiston area, where it would hook up with the regional grid, ultimately serving customers in Massachusetts. 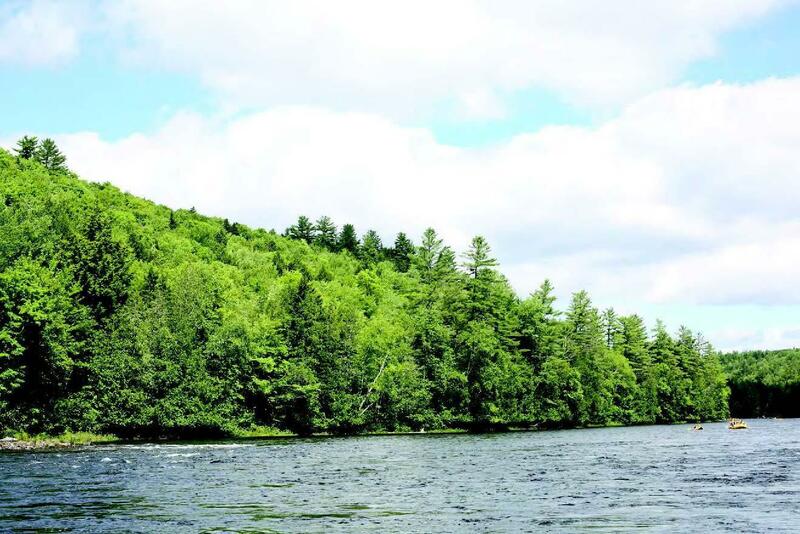 The project includes cutting a new corridor through about 53-miles of forest in western Maine and crossing the scenic Kennebec River Gorge. All four candidates for governor have doubts about the project . Independent Alan Caron offers the strongest critique. "I'm opposed to that plan,” says Caron. "I don't think it's a good deal for Maine, I don't see what value or benefit Maine gets. Once again we pay the price and Southern New England gets the benefit." Caron acknowledges, as do the other candidates, that the governor has no official say over permitting processes at Maine’s Public Utilities Commission or the Department of Environmental Protection. But he says he would lead a campaign to rally citizen opposition. That's a contrast to the apparent stance of Gov. Paul LePage, whose former energy advisor, Steven McGrath, once said the governor would "push this right through." "I think the Governor can certainly make the case to the people of Maine and mobilize opposition to a project that won't benefit us and will benefit other people elsewhere,” says Caron. “I would take this issue on forcefully all across the state." Democratic candidate Janet Mills and Republican candidate Shawn Moody are also wary of the proposal, although not as firmly opposed as Caron. "Until CMP demonstrates that their transmission line proposal offers concrete and long-term benefits to the people of Maine, rather than just to Quebec and Massachusetts, I have very serious questions about the proposal," says Mills. Mills notes that as part of its contract with Massachusetts, CMP is offering $50 million in energy efficiency investments for low-income energy consumers there — a benefit the company has not offered Maine. She also argues that CMP's recent problems accounting for what some customers say are wildly-inflated billing statements weakens the credibility of its claims in support of the new project. View looking northeast from the Kennebec Gorge - The new project includes cutting a new corridor through about 53-miles of forest in western Maine and crossing the scenic Kennebec River Gorge. "If CMP can't answer those questions first and foremost, I have questions about their ability to build a financially stable transmission line that will benefit Maine people,” says Mills. “I feel like if we can't really advantage ourselves as a state of Maine with this project, then we shouldn't do it,” says Republican candidate Shawn Moody. Moody sounds skeptical; he's concerned about rafting and tourism businesses that depend on the gorge. But he's also quick to note a few benefits of the project — the installation of new fiber-optic lines along the corridor, which he says will help out businesses in those remote areas. And he likes the idea that hydro-electricity from Canada will inject low-polluting energy into the regional mix. Moody says he is open-minded, but his ultimate support would hinge on whether CMP can offer Mainers a new revenue stream as part of its deal with Massachusetts. "I think we gotta look out for the benefits of all Mainers and make sure that there is a monetary gain ongoing, not just a one-shot deal, and I haven't heard that come forward as of yet, as one of the options,” Moody says. Independent candidate Terry Hayes, meanwhile, says she hasn't had time to thoroughly research the question, but "if I had to make the decision today I would be opposed." Hayes is concerned, she says, about compromising the state's "brand", and a seeming lack of benefits for Mainers. "If you really want to do this, win me over, give me the information I need to become a supporter, and I'm not sure that it's out there." The Public Utilities Commission's final general public hearing on the project is set for Wednesday evening at its Hallowell offices. There will be more hearings after that, featuring parties that formally applied for standing in the case. A final decision could come in late December. The state Department of Environmental Protection, meanwhile, has yet to schedule public hearings on the land use permit the project will need to move forward.